SHAH ALAM: I-Bhd will be launching some one million sq ft of property worth RM450mil at its flagship development, i-City in Shah Alam, this year, executive chairman Tan Sri Lim Kim Hong said. The company is launching more properties going forward as development at its flagship, i-City advances. Lim said the properties for sale this year included residential units and small offices home offices (SoHos) as well as small offices versatile offices (SoVos). I-Bhd is expecting sales of RM150mil this year. “Our plan is to launch about a million sq ft (of gross floor area or GFA) of residential properties every year. “In March, we launched the i-Residence project with about 540,000 sq ft of GFA. In the second half of this year, we will unveil our SoHo and SoVo developments to fulfill our 1 m sq ft target,” Lim told StarBiz. With this project, the company would be launching properties to the tune of RM450mil in gross development value (GDV) a year and this should translate into a steady development revenue of about RM400mil to RM500mil by 2014, he added. According to Lim, this would represent a significant leap for I-Bhd whose revenue from properties only averaged about RM15mil a year for the past two years. 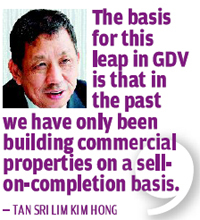 “The basis for this leap is that in the past we have only been building commercial properties on a sell-on-completion basis” Lim said. Apart from property development, I-Bhd also wants to ensure there will be recurring income from i-City when the development is fully completed. Lim said the venture into the leisure business had proven to be very profitable for I-Bhd. In 2010, the leisure sector reported an operating profit of RM2.1mil which increased to RM7.1mil in 2011. It has invested about RM10mil a year in leisure attractions since it first opened its City of Digital Lights to the public in December 2009, he said, adding that the company would be continuing with this level of investments for the next couple of years. Located on 72 acres in Section 7, Shah Alam, the development of i-City will take 10 years and will comprise some 12 million sq ft of gross lettable area for a total gross development value (GDV) of RM3bil. Of this, about 35% or 3 million sq ft will comprise residences, and the balance will be offices, commercial and retail space, hotel and service apartments, a convention complex, an intelligent school and a technology hub. The first residential project in i-City is i-Residence comprising a 33-storey block of 346 service residences and an adjacent double-storey block of 20 duplex suites. Since its launch two weeks ago, some RM130mil of the RM250mil project has been sold. Coming up next in the third quarter this year will be the commercial component comprising a street mall with retail, hotel and office space totalling some 1.5 million sq ft.